Jenni is a fifth year teacher at San Mateo High School in San Mateo, CA. Previously, she chaired the math department at Santa Susana High School in Simi Valley, CA. She earned a BS in Engineering from Harvey Mudd College in 2002 and a Master's in Mathematics Education at CSUN in 2008. Following a rocky first year of teaching, Jenni and her husband, Nathaniel, developed the what, why, and how of ProofBlocks - thankfully, her geometry classes have never been the same. Jinna is a fifth year teacher at John Francis Polytechnic High School in Sun Valley, CA. 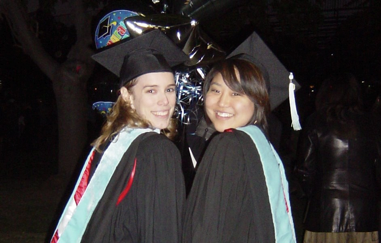 She earned her BS in General Mathematics with a minor in Spanish at UCLA in 2003 and has also completed her Master's in Math Education at CSUN - which is, coincidentally, where she met Jenni (and where they had to get used to answering to Jenna). She has taught with ProofBlocks for eight terms now and has found tremendous success using them with everyone from her remedial to honors students. Nathaniel is a Character Technical Director at PDI/DreamWorks, who enjoys applying mathematics to lion manes and ogre wardrobes. Ivan is a National Board certified teacher and an assistant professor at California State University Northridge. He is actively involved in teacher preparation and professional development.